Worse still the then <?xml:namespace prefix = st1 ns = "urn:schemas-microsoft-com:office:smarttags" />Burnley manager admitted that he had no idea what was his best position and said he wasn’t ready to go straight into the first team. That was the welcome for the new signing by the name of Glen Little. It didn’t take long for Burnley fans to at least realise the new man wasn’t Irish, the first interview gave that one away. We had signed a Londoner who had been released by Crystal Palace and gone over the water to play for Glentoran, a club with more than one Burnley link. We’d signed Jimmy McIlroy and Alex Elder from them and their manager at the time was Tommy Cassidy. Not only that another former Claret Billy Hamilton had recommended him. It was a month before he got near the first team and then it was as a late substitute for Jamie Hoyland at Peterborough. He did get a few games before the end of the season but the manager said he was some way away from being ready to play in the first team on a regular basis. The fans had liked what they saw and when the following season got off to a disastrous start there was some surprise that he wasn’t getting into the team. New manager Chris Waddle was strangely quiet on the subject but at a Supporters’ Club function his assistant Glenn Roeder turned on a couple of supporters who decided that the manager was crap and that Glen should be in the side. Roeder was actually paying Little a compliment and was praising his attitude and the way he had improved since he and Waddle had been at the club. The two fans continued to barrack him and were totally unwilling to listen to what Roeder had to say. He snapped and in retaliation he said that Glen wasn’t fit to lace Waddle’s boots. It has since been taken so out of context it has been ridiculous but for those of us prepared to listen Glen Little was actually being spoken about highly. He eventually did get into the side and eventually Waddle’s Burnley started to play and started to win games. It was a scrape in the end, a desperate win over Plymouth on the last day of the season had rescued us. Little had more than played his part and was now very much a hero of the Burnley crowd. The young winger had turned in some superb performances during the second half of that season and it was perhaps one of the best periods for him. Waddle went and in came Stan Ternent with many predicting that Glen would not be his kind of player. The simple answer is that in the last six years no one has played more games for the Clarets than Glen although there have been times when he has been left out and at some vital times. 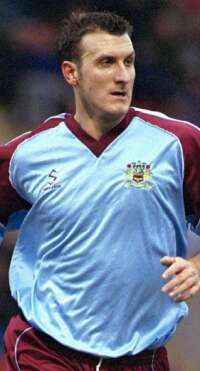 He was only on the bench during the cup run of 2002/03 season and was in the same place on the last day of the season four years ago when he came on to score the winner at Scunthorpe. No renowned for his goal scoring he certainly came up trumps that day but almost certainly the Glen goal best remembered will be the one three months earlier when we beat the league leaders Bristol Rovers 1-0 with ten men after Andy Payton was sent off. It was a tremendous performance that day but Glen had been our least effective player, that was until he scored the stunning winner as he beat defender after defender before getting clear in the box. He could be ineffective and Stan was even harsher than Roeder at one fans’ forum when he claimed that he was a waste of time when the opposition had the ball and it was like playing with ten. Nobody minded though because at his best he was worth the admission money alone and he was capable of tearing a team apart. There was the first match back in the First Division at Bolton. Again he was on the bench but he came on and destroyed Bolton in the second half and only eighteen months ago he did exactly the same to Spurs in the Worthington Cup. “We couldn’t handle Little,” said Spurs manager Glenn Hoddle after the game. They couldn’t, he had come on and destroyed the Premiership side. Those days sadly have not been as frequent, maybe the never ending run of hamstring injuries have taken their toll. Certainly he has just finished his least effective season with us when the Glen of old has only very occasionally surfaced. The club have done all they can though to keep him but he has decided it is time to move on to pastures new and will sign for Reading very soon. They were one of the two clubs he was shipped out to on loan. It was a purely financial decision we were told by Chairman Barry Kilby but in all honesty it probably cost the club money with the loss of season ticket sales. Last autumn he was on the move again with a two month deal at Bolton but he never did get a Premiership start. As Glen goes after over seven years we don’t want to remember the poorer games, or the times out on loan. We want to remember the Bristol Rovers goal, the Spurs performance, the Bolton performance, that run of form under Waddle and the goal at Scunthorpe. 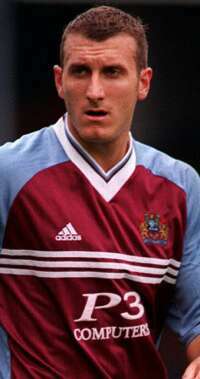 And then there was probably his best period for the Clarets when he and Alan Moore were running defences ragged as we topped the First Division at the beginning of the 2001/02 season. 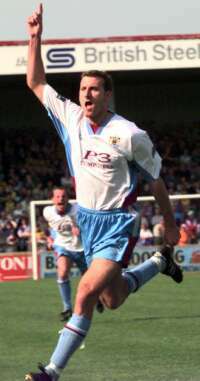 He was even getting goals and in two brilliant performances at Bradford and Birmingham he scored twice. That’s how I want to remember Glen. The player that excited me, the player that had me on my feet so often during a game. Thanks Glen, they are brilliant memories.